Patented No FeedBack Steering Control for about the cost of an old-fashioned steering replacement. 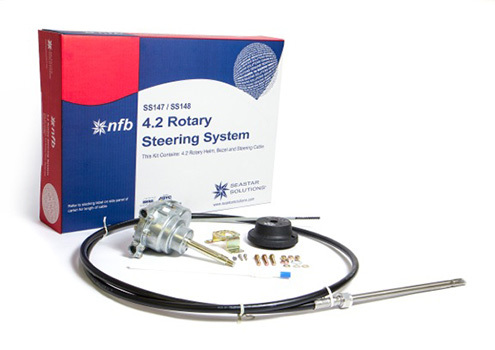 With the advantage of 4.2 turns lock-to-lock and our patented No FeedBack steering to lock out steering loads, SeaStar Solutions 4.2 Rotary NFB Steering is the ideal single-cable system for most non-power-steered boats. The rugged dual cable system is made for applications with engine flutter or steering instability. The helm is a drop-in replacement for current generation Safe-T with no dash modifications required. NFB 4.2 single-cable systems are suitable for most single-station boats with a single non-power-assisted outboard and sterndrive engines up to V-6 and minimal engine flutter or steering instability. 4.2 accepts wheels up to 16” diameter. Use dual cable system for boats with engine flutter or steering instability. Replaces nearly all SeaStar Solutions Safe-T® steering systems (including twin cable) without dash modification. • Patented No FeedBack™ Steering mechanism. • Fast, easy installation: uses SeaStar Solutions Quick Connect (QC) steering cable. • Kits include: cable (2 Cables for dual system), helm, 90° bezel and hardware.